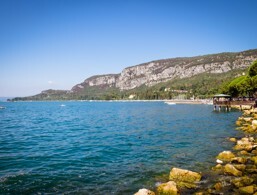 Holidays in Garda ↔ Discover Lake Garda! Garda is one of the most popular seaside resorts and is known for its excellent olive oil. Garda is undoubtedly one of the most popular holiday resorts at Lake Garda, which is probably due to the sheltered location between the two ridges of Monte Luppia in the north and Rocca di Garda a table-shaped mountain in the south. This affects, in particular, the mild climate and the idyllic landscape with cypresses, pines and olive trees. Combine this with a naturally beautiful bay, and it results in a perfect holiday ambience. Gorgeous here is the very rare, golden and sparkling sunset. The similarity between the name of the city and that of the lake on which it is located is obvious. Its origin is however controversial. Legend has it that the nymph Engardina claimed a large lake as a proof of love from the god of the sea. He struck with his trident against the rocks and immediately huge waves shot out and formed a lake. Engardina jumped in, and the water took on the colour of her blue, shimmering hair. In the historical, etymological attempt to explain Garda is derived from the Germanic word "warden" (later "garden"), which means “to observe”. The striking rocks above Garda are indeed ideal observation posts. So it’s hardly surprising the first castle was built there in the 5th century. In the Middle Ages, Charles the Great raised the place to the county, which then came under the rule of the commercial trading power, Venice. In the old town, you will find the remains of Venetian palaces. 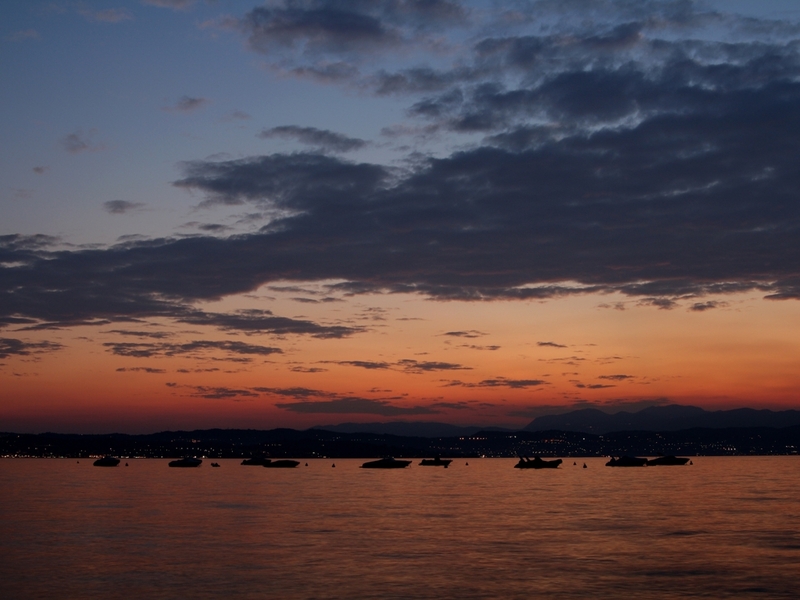 There are many excellent cafes, restaurants and ice cream parlours with lake views on the promenade. Those who prefer a more rustic feel can retreat to the picturesque town centre, which is characterised by narrow lanes, partly arched paths and two mighty gate towers. 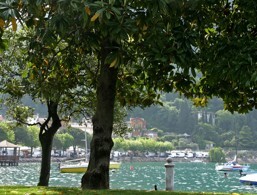 Discover the historical centre of Garda. Punta San Vigilio is located between Garda and Torri del Benaco. Garda has numerous dreamlike parts, such as this old arch in Via Manzoni. The Palazzo dei Capitani is a famous suject for souvenir photos of the holidays at Lake Garda. 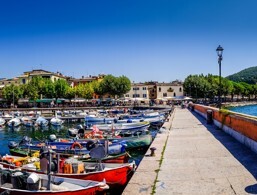 The city harbour and the Palazzo Capitani attract numerous visitors at the Lake Garda. 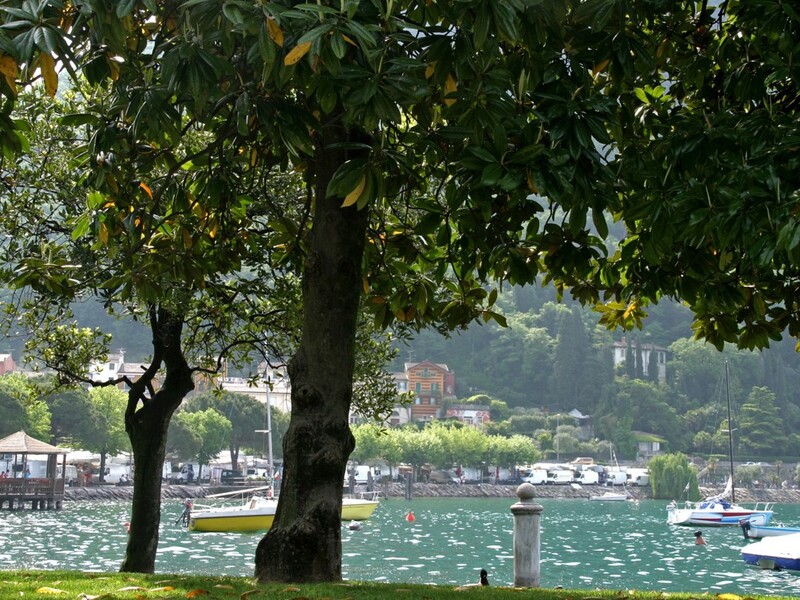 From the waterfront promenade Reghina Adelaide, you have a wunderful view over the table mount Rocca di Garda. The baroque parish church is located below the Rocca. Numerous restaurants and bars invite you to relax and to enjoy culinary delights. Idyllic shore at the Lake Garda. 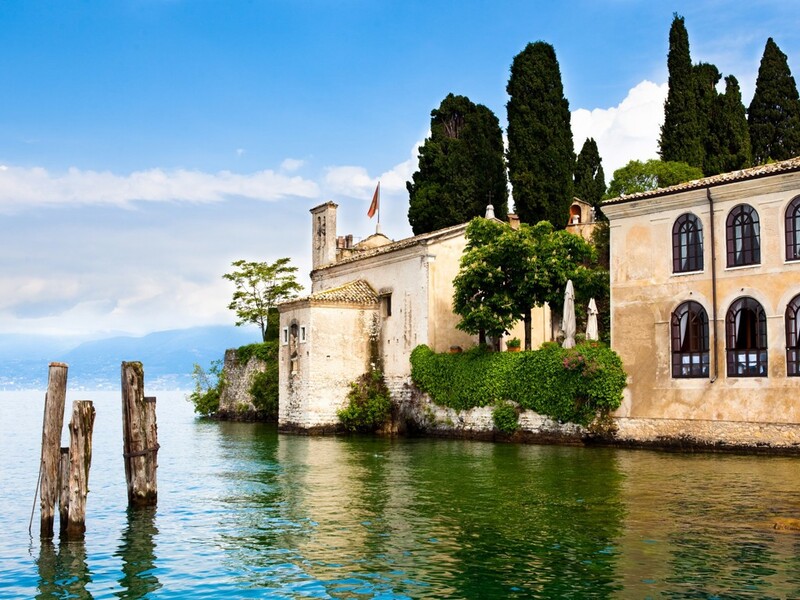 In the 15th and 16th centuries, the Venetian merchants built numerous palaces in Garda. Among the most important is the Gothic-inspired Palazzo dei Capitani, which can be found in the central Piazza Catullo. The pale yellow facade with pointed arched windows is usually beautifully decorated with flowers. 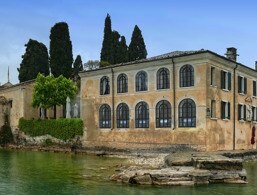 Formerly, the palace stood directly on the lake and was the seat of the Venetian head of the coastal communities. In the same district is the Palazzo Losa (also called Palazzo Carlotti), designed by the Veronese architect Sanmicheli and had long been used as a customs office. Worth seeing are its arcades and the balcony loggia. The parish church of Garda is located below the castle hill, directly on the main artery Gardesana in the south of the city. It was built in the 15th century and later became Baroque. Inside, it houses a large wooden cross with suffering Christ from the 16th century. In the prisoner chapel, there is a remarkable altarpiece by the Veronese artist Palma il Giovane. The courtyard connected to the church, once a convent to the monastery of Chiostro Della Pieve, is decorated with frescoes. Villa Albertini, a magnificent building with towers and battlements, is hidden behind a wall at the northern end of the old town. Particularly striking are the yellow facade of the older part and the red towers, which were added in the 19th century. The Villa Albertini was briefly the residence of King Carlo Alberto of Piedmont. Today it is privately owned and not open to sightseeing. The striking table shaped mountain which rises in the south of Garda about 250 metres, can be reached in an hours walk. The path begins to the left of the church of Santa Maria Maggiore. The exhausting climb is definitely worthwhile because of the stunning view, and there are also some remains of the castle to discover. A strangely shaped boulder called the “Throne of Adelheid”, is reminiscent of an adventurous story set in the early middle ages about the Burgundian princess Adelheid. The accommodations at Garda were rated 4.3 out of 5 stars by 33 users.